J Lazarus is formulating the best flavors of hip-hop into blockbuster tracks and making the audience experience music with renewed vigor. CHICAGO - Feb. 11, 2019 - PRLog -- J Lazarus is an upcoming Illinois rapper who is putting together bits and pieces of elemental hip-hop strains into a personal playlist of visionary tracks. His fundamental objective as a hip-hop artist is to bring about substantial change in the spectrum of the rap community. J Lazarus does not confine his lyrical spontaneity to a specific subject matter or theme. He ventures the streaks of various social and personal issues and everything that comes under the sphere of human existence. His songs are all about the universal struggle and the notions of motivation throughout life. Positivity and honesty are the two basic structural entities to his tracks that play along with a stunning arrangement of groovy music. 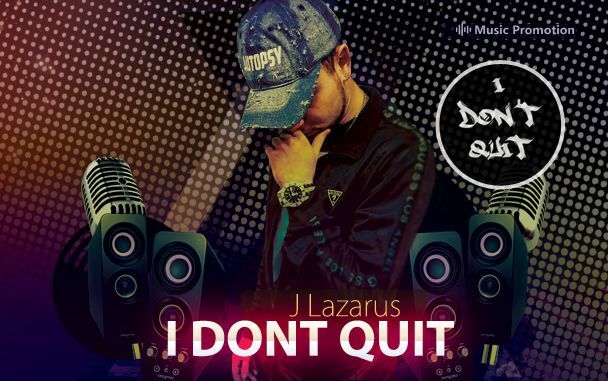 J Lazarus is already making big waves of audience stream with his songs like 'I Dont Quit'. With his work, he wants to motivate people around the world through the positive integrals of life. Currently, he is working alongside label house Courtlin Jabrae, producing and promoting appreciable tracks. J Lazarus has a deep connection with his faith and beliefs which reflects beautifully in his song. His struggles, motivational tract and emotional contingency of his life all come together in boisterous celebration in 'I Dont Quit'. Illinois rapper J Lazarus's sound and lyrics are inspired from a number of influencers in the collective compass of hip-hop. Eminem and Future are some of his major creative inspirations as he keeps collecting intellect of rap and hip-hop styles from a number of artists. Although he is very new to the scene, his fans are handsomely numbers and growing exponentially with each passing day. He is already working on a new track 'Don't Say Sorry' which is scheduled for release this Valentine's Day. Get a load of this zestful journey of music by following J Lazarus on Instagram and Soundcloud now!